The Saxon king Alfred, a late ninth century ruler who unified several kingdoms of England and thwarted the Danish Vikings from taking over at every turn, is commonly referred to as ‘the Great’ by historians. But maybe ‘the Magnificent’ club of Suleiman, Lorenzo de’ Medici and co should make room for one more, contends Rebecca Huston, a former National Geographic Channel producer and American screenwriter who after ten years of original research and analysis believes the king single-handedly saved the country from being permanently absorbed into Scandinavia. Never mind a one-nation Brexit, this was a one-man Brepel! This wasn’t through force. Alfred simply demonstrated that the pen is mightier than the sword. Over a thousand years before the exploits of Bletchley Park saw off one army of foreign invaders, he delved into old manuscripts to stop another. By doctoring a Latin version of one of the ancient world’s most famous writings, and altering several Old English manuscripts, he was able to convince his council of nobles that his son Edward was the rightful heir to his throne, not his nephew Æthelwold, a Saxon susceptible to alliances with the Danes. And the astonishing upshot of this discovery is that Julius Caesar neither invaded nor conquered Britain in 54 BC. Along with the collected letters of Cicero, the memoirs written by Caesar while he was conquering France and other areas of central Europe in the fifth decade of the first century BC is believed by many to be one of the few manuscripts to have survived the period. But there is a very good chance that Caesar’s ‘Commentaries’ did not survive, and that ‘Bellum Gallicum’ (BG), the title it is known as today, was the work of other writers. Historians are wrong to treat it as gospel and to suppose this was the true voice of Caesar. But many do, and therefore they duly accept that he invaded Britain. Ancient writings only survived because they were painstakingly recopied by hand, and also translated, mostly by monks at monasteries when it was judged the current version was becoming a little worse for wear. This made them vulnerable to change. As an avid translator of Latin texts into Old English with all his kingdom’s manuscripts at his disposal, Alfred was ideally placed to meddle, and Huston claims she has found compelling evidence among 6,000 pages of ancient and medieval texts that Alfred fabricated Caesar’s two ‘invasions’ of Britain in 55 and 54 BC and added them to what would become BG. In reality, she says, the first ‘invasion’ did not take place, and the second was a passing visit. Many academics concur the king of Wessex, Kent, Essex, Sussex and the western part of Mercia also translated and revised five old English works – including translations of ‘Ecclesiastical History’, an eighth century work by the Venerable Bede, and ‘History Against the Pagans’, a fifth century work by Orosius. Significantly the old English versions of the pair’s works include details about Caesar’s invasions, but the Latin versions do not. Bede, for example, relied on the sixth century monk Gildas for all of his early British history, but Gildas never mentioned Caesar or his invasions, suggesting the inclusion is not Bede’s work. Tellingly, the earliest-known copy of BG dates back to the last quarter of the ninth century, coinciding with the latter years of Alfred’s life. 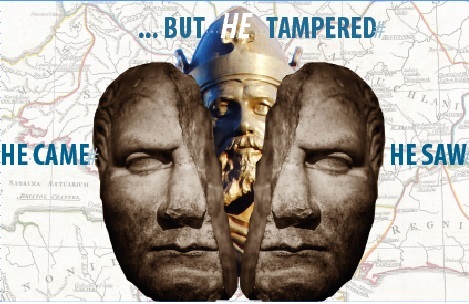 “Alfred was the anonymous author of ‘Bellum Gallicum’ because highly-specific details about Alfred’s own life appear in the text that could not have been written by Caesar nor be known prior to Alfred’s lifetime,” Huston told CPH POST. Huston points out that many scholars, including Germany’s Heinrich Meusel and Alfredus Klotz, have shared doubts over the authenticity of the passages – with Klotz suggesting that a “pseudo-Caesar” added false details, and Meusel questioning why Caesar wrote like an Englishman. Historians have for centuries been stumbling over the truth, but have either not noticed or ignored the evidence – in some cases, suggests Huston, because Alfred was believed to be the spiritual founder of Oxford University and it would have been highly controversial! For example, the early 20th century work ‘The Cambridge History of English and American Literature in 18 Volumes’ acknowledges Alfred’s idiosyncratic style of drawing on his experience in describing the military exploits of others, while 19th century scholar Charles Plummer contends that the pious Alfred could not resist adding Christian elements, claiming that ‘History against the Pagans’ shows a “remarkable divergence from historical fact”. Additionally, as a champion of indirect discourse (when he wasn’t saying “Veni, Vidi, Vici”! ), Caesar would have never lapsed into the first person, as is often the case in BG – such a writing style was abhorrent to him and he even included his dislike in a book on classical Latin grammar. Huston’s groundbreaking analysis of BG has yielded 120 examples of Alfred’s idiosyncratic writing style (including word choice, verbose style and peculiar errors) along with 40 references to his own life and times. For example, BG records that Caesar arrived in 54 BC on clinker-built ships – a vessel never used by the Romans and not by anyone until the third century – which were familiar to Alfred as they featured heavily in his own West Saxon fleet. In addition, the description of the Britons in BG closely matches that of the Danes in the ninth century, while Caesar’s experience fighting them is similar to Alfred’s against the Vikings. The ancient Brits, according to BG, wore animal skins and did not eat grain – a claim contradicted by modern archaeologists. Throughout BG, Celtic and Old English terms frequently appear, geography is referenced that is six centuries premature and anachronistic errors are made regarding Roman weapons not yet invented nor used. For example, the Latin term ‘equites’ is used to mean knights, but in Caesar’s day it meant money-lenders, while the four kings of Kent who surrendered to Caesar were family members of Alfred’s, and one of the surrendering British tribes, the Ancalites, is named after a sixth century shield used by Alfred’s ancestors. “Similar to the mastermind character Keyser Söze in ‘The Usual Suspects’, Alfred adroitly spun the tale of Caesar’s British ‘invasions’ by fictionalising objects likely found in his immediate environment,” contended Huston. No archaeological evidence has ever been found in southern England to confirm the Romans under Caesar fought the Britons as claimed in BG, with modern historian Richard Warner (in ‘British Archaeology’, 1995) asserting that the only reason people believe Caesar invaded Britain is because of his memoirs. Not one ancient writer prior to Alfred mentions the invasion – not even Suetonius, who as the first official Roman biographer of Caesar and head of the Imperial Archives in Rome, had access to Caesar’s personal papers, daily military diaries and reports to the Roman Senate. In 36 of Cicero’s letters from 54 BC, of which some were written directly to Caesar, not one mentions an invasion or fighting or transport problems despite many references to Britain. Cicero had good reason to be interested, as his brother took part in Caesar’s visit. There is no evidence of the Roman camp which would have stood for three months and housed 25,000 soldiers, the battlesites – others have yielded countless finds – or the voyage over. According to BG, 800 ships were launched from Port Itius in France in 54 BC – a location that would struggle to see off more than a hundred, according to a French admiral serving in the Napoleonic Wars. A five-year mission launched in 2000, which was co-sponsored by the British Museum, tried to find the remains of 52 ships that supposedly sunk when Caesar ‘invaded’ Britain (12 in 55 and 40 in 54 BC), searching predominantly seven miles northeast of the cliffs of Dover – the area identified by BG. BG also details the loss of 120 Roman anchors, of which each one weighed 680 kg and measured 2.8 metres across. The mission used SONAR technology that can identify a teapot at a depth of 500 metres, but nothing was found. Ancient shipwrecks and anchors will deteriorate faster in warmer waters, but while dozens have been found in the Mediterranean, not one has been discovered in British waters. Before his accession Alfred had promised his predecessor, his brother Æthelred I, that the dying king’s sons would take precedence over his own offspring and one of them, Æthelwold, was accordingly the senior heir. Under Saxon law the kingship was not Alfred’s gift to bestow. But he did his best to make his son Edward the most logical heir, leaving him the bulk of his lands and even having the bones of his predecessor moved from Steyning, an estate left to Æthelwold, to Winchester, his capital. Alfred’s citation from BG helped to strengthen his claim to the same rights and responsibilities as Caesar, the ‘conqueror’ of the five territories he ruled over, because of an additional lie that no records support: that he had been consecrated in Rome by Pope Leo IV during a pilgrimage he made aged four in 853. Accordingly, he claimed he had inherited the ancient right of a conqueror to name his successor, thus superseding his agreement with his brother. Furthermore, by claiming the ancient nobles of Britain accepted Caesar’s choice of ruler of the exact same kingdom Alfred presided over, he could argue Roman authority superseded that of the Saxons, and that the ancient right was inseparable from the land. “The anonymously-forged ‘memoirs’ were good enough to fool Alfred’s Latin-illiterate council of nobles,” contended Huston. Edward duly succeeded Alfred in 899, prompting Æthelwold to launch a rebellion backed by Scandinavian allies, which he died fighting in three years later. Edward’s grandson Edgar the Peaceful went on to unify the kingdoms of England in 957, although this was shortlived. While the Danes did eventually conquer the whole of England in 1013, their 29-year rule was not long enough to permanently absorb the country into a Nordic empire. Had Alfred not intervened, they could have ruled England for 143 years, or even longer.